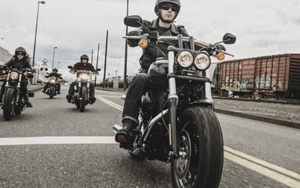 Harley-Davidson has done what many scoffed at a few years ago: Taken a brand with an aging owner base and made it a must-have product, and a must-join community for young adult riders. The company did it with a garage full of new products, like those under the 8-year-old Dark Custom lineup, and marketing that gives no quarter, thanks to a rough, rebellious spirit featuring real riders, of all ages and backgrounds. Loyalty scarcely needs mentioning. Go to Sturgis and count the Harley tattoos. In addition to benefiting from a strong corporate culture, H-D benefits from Mark-Hans Richer, global CMO, who has been on the job for eight years. How did a former Pontiac marketing guy get the coveted job? Word has it he rode to his second interview on a Harley. Marketing Daily got him off the bike for a minute to talk about the brand's success. Q: How has your share of 18- to-35-year-olds grown? Q: But loyalty is notoriously unpredictable and malleable among younger people. A: We have actually found that millennial loyalty to H-D is just a little greater than boomer loyalty. And this generation is the same size as boomers. It's not "maybe I'll try it" -- it's "I want it, love it, and will get another one after this one." Q: Because of Dark Custom? That's what younger riders are buying? A: Our number one bike for young adults is actually Street Glide, which is not a small bike. Dark Custom helps, and that's an attitudinal positioning -- the same idea as what Harley-Davidson has always stood for, but more relevant to a different generation of customers. Q: How's the market so far this year? It's been flat overall for a while, hasn't it, for everyone? A: We didn't have a great Q1 this year because when the dollar appreciates as strongly as it has, it hurts our exports and our competitors, except for Polaris, get favorability of that exchange rate, and they can use that to do promotions on price. They do that, we don't, so we will ride this out until those things settle. Q: What do you focus on when results aren't what you'd expect? A: The long term trend is what care about. We don't care what sales for the day were, but about customers behind the sales. That's our strategy: not playing quarter to quarter. We care about attachment to Harley as an aspect of meaning for a person. For us loyalty isn't just repeat sales. It's when it means so much to you, you wouldn't be the same person if you didn't own this brand. So we are long-term, customer-led company. We care about sales, but care more that there are customers behind sales. Q: Do you market Harley-Davidson as a different kind of brand for Hispanics or African-Americans than to your core market? A: The biggest risk for us if we try to grow with new audiences, whether young adults or Hispanics, and try to be something we are not. We aren't trying to be five different Harleys, but one Harley in five different ways. Q: What is your media mix like? A: We don't do a lot of TV, relative to our budget. Eighty-five percent is Web, events, and social media. We are a very experientially-centered brand. We often invest in events riders are already going to. And we train about 40,000 people every year to ride with Riding Academy, through our dealerships. I doesn't always translate to a new sale right away, but that's okay. And we were just in the X-Games, thanks to a great partnership with ESPN this year. We have done dirt track racing for decades, so we worked with ESPN to make it a metal sport in in the X-Games last week. Q: Your advertising is different. You use real owners. Why? A: We don't parade a fantasy world that doesn't exist. We put a camera on a world that does exist. That is obviously the best advertising. We don't need to get too tricky. I would hate to put "Actor Portrayal" on our advertising.